Although some of you are already aware, I thought I’d share some recent news with the more extended Expeditionr readers out there. In case anyone is confused as to the status of our immediate family here at Expeditionr, there are actually two families to speak of: 1) those of the human variety and 2) those of the mechanical or automotive variety. While we had an addition to the human team just over two years ago, the more recent news involves a new addition joining the automotive side of the house. This newest member, who shall remain nameless for the moment, has been drafted to the automotive team in order to provide two much needed services – towing and hauling. So as fate would have it, even though this recent turn of events was more coincidental than planned, the timing worked out quite well and our new member is settling in quite comfortably so far, quickly building a foundation of loyalty through steady and reliable contribution. If you’re wondering why we purchased a separate vehicle when the FJ is perfectly qualified to tow, the answer is two-fold. Firstly, the FJ is limited to a 5000 lb maximum towing capacity. Secondly, the FJ, in future scenarios, will become the “towee”, rather than the one doing the towing. It goes without saying that I’m a huge fan of the FJ Cruiser. But this scenario harkens back to the old adage of using the right tool for the job. The FJ was designed as a comfortable commuter and capable off-roader. In these areas it achieves high marks. But when it comes to heavy duty towing, the FJ Cruiser lacks the capacity to keep up with it’s larger V8-powered cousins. As far as hauling, the internal space of the FJ is quite limited and the suspension was simply not designed to support large amounts of weighty cargo. So we needed an alternate solution to fill in the gap and began looking for a new draftee back in late February of this year (2012). Having owned a string of Ford Powerstroke diesel pickups over the years, the question of brand was pretty much a no-brainer. That’s not to say that Chevy or Dodge products are any less capable. My personal preference for Ford trucks is based on a long history of Ford truck ownership, specifically those powered by Ford’s IDI and Powerstroke diesel engines. As heavy duty pickups go, Ford trucks have always treated my very well and have been more than capable of hauling anything I put behind them with ease. My very first Ford truck was a 1991 Ford F-250 with a 6.9 liter IDI diesel engine. After less than a year of ownership, I made the mistake of selling it for a sports car at the time. I quickly regretted my decision after only two weeks and began searching for another Ford diesel to replace it. I found a 1994 F-350 crew cab long bed that housed Ford’s first official 7.3 liter Powerstroke branded engine. From that point forward I traded up almost exclusively for newer Ford diesels, to include a 1997 F-350 standard cab, a 2002 F-350 super cab, and a 2005 F-350 crew cab – all powered by Ford’s patented Powerstroke diesel for each respective model year. So as I stated earlier, the manufacturer was never in debate. The trick then was to find something that would meet our needs without killing our bank account. Anyone who’s purchased a new diesel pickup in the last five years is no doubt aware of the average going rate for a brand new truck. We decided pretty early on that we didn’t want to spend anywhere near to that kind of cash. So I started perusing the used truck ads on Craigslist and various online truck forums. One of the advantages of owning and driving a collection of trucks spanning 14 model years is that it gives you some pretty good insight as to the strengths and weaknesses of the individual builds for each year. In my case, I did a lot of digging into the pros and cons of the 7.3 liter engine versus its eventual replacement, the 6.0. The 6.0 liter engine was first introduced in the 2nd quarter of the 2003 model year and continued to serve as Ford’s primary powerplant in their Super Duty diesel trucks until the 6.4 liter engine arrived in 2008. There is a plethora of online information available on both the 7.3 and the 6.0 liter engines, but like anything on the Internet, one must carefully consider the sources to determine the validity of the information being presented. In my case, I had experienced zero issues with either engine, but research showed the 7.3 liter engine to be more resilient to bad fuel, extended oil change intervals, etc. In other words, the 7.3 could handle a lot more abuse than the 6.0 liter engine. There were also a host of problematic issues associated with the 6.0 liter that at first glance might sway a potential buyer in the direction of the 7.3 liter. However, if you continue researching long enough to get past all the nay-Sayers and nonsensical chatter, you’ll find that most of the problems noted in the 6.0 liter design have been fixed or can be easily eliminated using aftermarket parts. On top of that, the 6.0 liter trucks produce considerably more horsepower and torque and have the added optional bonus of being mated with a TorqueShift 5-speed automatic transmission. One of the biggest weaknesses in the older 7.3 liter trucks was the 4R100 4-speed transmission as it just wasn’t designed to stand up to the torque of the 7.3 liter engine. The TorqueShift on the other hand, performs like a champ under stock conditions with very little notable problems. Cosmetically, the look of the trucks didn’t vary a whole lot until the 2005 model year trucks, where Ford changed the design of the front grille, lights, mirrors and more. Interior options increased as well with Ford now offering features such as a built-in brake controller, upfitter accessory switches, automatic climate control, switched rear sliding window and a factory sun roof. The 2005 trucks were also subject to a suspension overhaul, moving the front end from leaf springs to a coil spring system. This change resulted in a slight improvement in ride quality and helped to reduce the overall turning radius. In the areas of payload and safety, the newer trucks benefited from a thicker frame and larger brakes, allowing them to increase their previous gross vehicle and gross combined weight ratings. In the end, the decision was pretty easy to make. 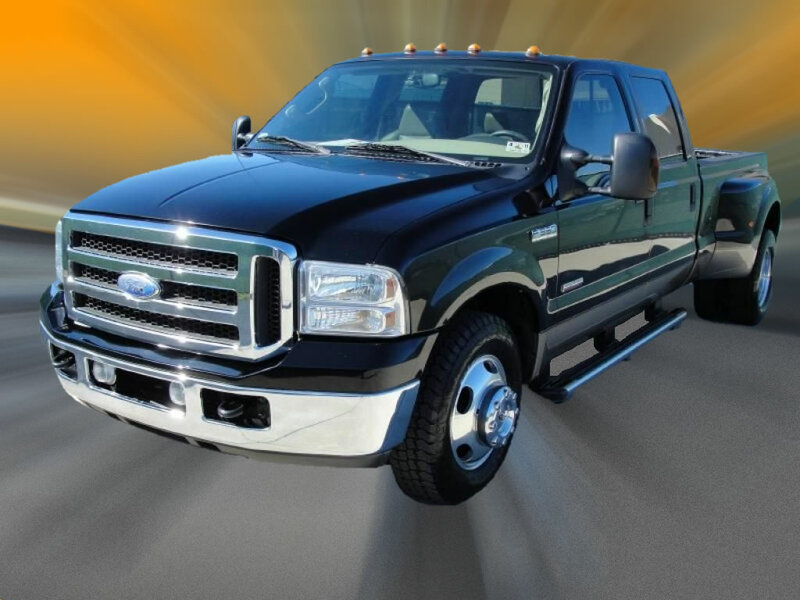 In order to maximize our interior space and our hauling capacity as much as possible, we set our sights on advertisements for Ford F-350 crew cab dually trucks built between the 2005 and 2007 model years. After strategically researching a variety of ads and options available, we finally found a truck that met all of our requirements. My initial inspection of the truck (prior to purchase) had left me confident that the truck was in good order, but I’d decided to take the extra step and have the truck inspected by a local Ford dealership as well. This particular dealer had a dedicated shop of diesel mechanics as they were responsible for servicing many of the Ford truck fleet owners in the area. By the end of the inspection, the proposed repair bill for everything combined was slightly more than I expected, but the total amount of issues was minor. The bulk of the repair cost involved replacing a cracked turbo inlet pipe and a leaky rear axle seal. All in all, I was very happy. It took a few weeks in total to coordinate inspections, sales paperwork, and all the financing details, but as of March, 2012, we officially became the proud new owners of a 2005 Ford F-350 Super Duty pickup with only 54k miles on the odometer. Now that the truck was sitting firmly in our driveway, it was time for the second portion of Operation Powerstroke. During some of my initial comparison research on the differences between the 6.0 and 7.3 liter engines, I happened across Powerstroke Specialties, or as they’re better known on the interwebs, PowerstrokeHelp.com. Located in Buford, Georgia, the company’s owner, Bill Hewitt, has spent the better part of four years generating free online tutorials and other informational videos, detailing the ins and outs of Ford’s Powerstroke engines. If you have some spare time and are interested in finding out more about your Ford diesel, I highly suggest visiting Bill’s Powerstroke Help channel on YouTube. As a caveat, I feel the need to point out that some of the information provided in older videos has since been superseded by newer content or updated information from Ford. Like any online resource, common sense should be employed when reviewing any technical information, but overall, Bill’s videos are a great resource for Powerstroke owners. New Gaskets – Intake, Exhaust, Fuel Bowl, Oil Pump, etc. In summation, I’d just like to sincerely thank Bill, Scott, John, Mike and Gambino at Powerstroke Specialties for making this trip a complete success. Scott, in particular, is a great guy to deal with and really bent over backwards to help me in the total cost of this upgrade. Out the door, the final price for bulletproofing, upgrades and repairs was not cheap, but the end cost was more than fair considering all the work that was done. If I had to do it all over again, I wouldn’t hesitate to make the trip to Georgia if it meant these guys would be working on my truck. They did a great job in record time and I’m extremely pleased with the trucks newly-tuned throttle response and day-to-day performance. And knowing the engine will be trouble-free for years to come makes it all the more worthwhile. 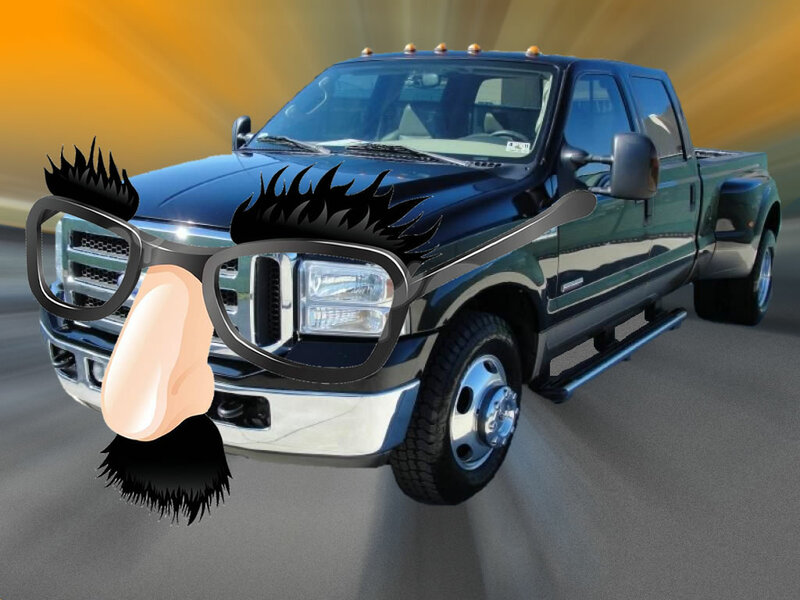 If you’ve made it this far in the article, you’re probably asking yourself, “But who is the masked mystery vehicle in the photo above?” Up ’til now, the truck’s identity has remained a secret, unknown to anyone outside the immediate Expeditionr family. But fair is fair. You’ve shown tenacity and fortitude by reading this entire article and deserve to be rewarded for your efforts. Although we still don’t have a whole lot of photographic proof that this new member really exists, we did manage to capture the truck during an “off” moment when he wasn’t wearing his disguise. So we’d like to take this opportunity to introduce all the readers to the newest adopted member of the Expeditionr family – a member who shall be known henceforth as the mighty HAULHOG. Here’s to you, HAULHOG, and your continued longevity and reliability in the years to follow. HINT: Click the image below to view HAULHOG’s secret identity. With several months of driving now under our belt, HAULHOG continues to impress us. Compared to our previous 2005 Super Duty Powerstroke, which was completely stock minus a lift and tires, the performance of this latest truck runs well above expectation. For daily commuting we’re currently running the Performance tune off the SCT Tuner, netting us around 405 horsepower and 710 foot pounds of torque. Considering HAULHOG’s curb weight is north of 8,000 pounds, the “get-up-and-go” factor is pretty impressive, especially on the top end. As of right now, the projected 5th wheel weight will be just over 9,000 pounds, finishing well under the GCVW rating. HAULHOG will of course be detuned somewhat, using the Towing tune (385HP/660TQ) to reduce the EGTs as well as assist with shifting on grades. Regardless of the tuning, I have great confidence in the truck’s ability to get us there and back with the ease and comfort I’ve come to expect from Ford Super Duty trucks. Stay tuned for more adventures both on and off the pavement! Thanks, Tony. So far we’re pretty happy with it too. Had a brief meeting with a deer about a week ago that took out the driver’s side fender. Hope to get that fixed next week some time. Other than that, it’s running like a champ and I’m very happy we went with the 6.0 liter over the 7.3. On a separate topic, will we be seeing you at this year’s CMCC?